I'd earned a free drink from Starbucks ages ago, but I hadn't been in a healthy enough state to enjoy it. Finally today I felt up to it (although my sinuses may disagree) and zipped down the hill on my lunch break. I'm still reveling in the joys of the mobile app on which I can place my order and pick it up at the counter without standing in line or interacting with people (the horror). Or at least that's how it was previously. Today, sadly, I was forced to speak with a barista to retrieve my drink, which I could see in a newly designated area out of my reach. People must have been stealing drinks, thus spoiling some of the appeal of mobile ordering. Crappy people, always ruining good stuff for the rest of us. 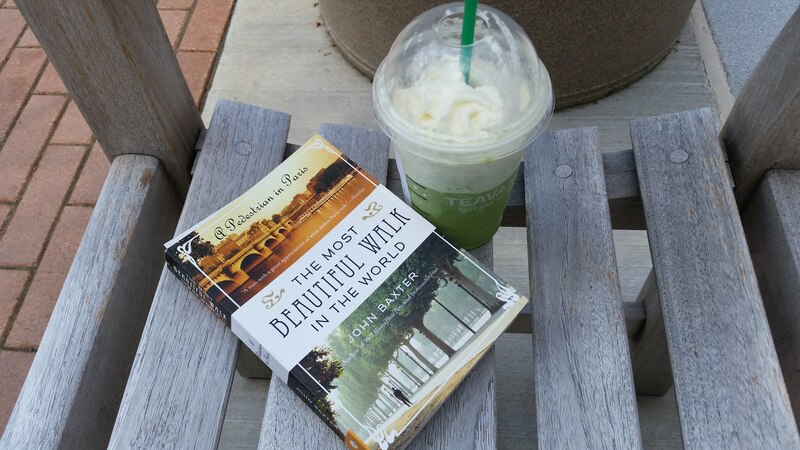 After securing my green tea frapp I walked back up the hill in search of an unoccupied bench in the shade. I passed a good handful positioned on the hill at an angle. No thanks. I've done enough camping in my lifetime with the tent set up on a slight hill to know that a similarly situated bench would irk me to no end. I can't be sliding off one end of the bench for my whole reading session. This book is bewildering. It is interesting, occasionally humorous and also a bit dull at times. I'm just shy of halfway through it and frankly, can see no real point to it's meandering existence. Hopefully this becomes more clear SOON. And I don't like slanted benches either, but even less do I like meandering books.